Artistgroup Sisterhood has explored the issue to wander in common and individual experience. Painting "Botafumeiro" is inspired from the botafumeiro in the cathedral of Santiago de compostela,Spain,at the end of the pilgrimage. 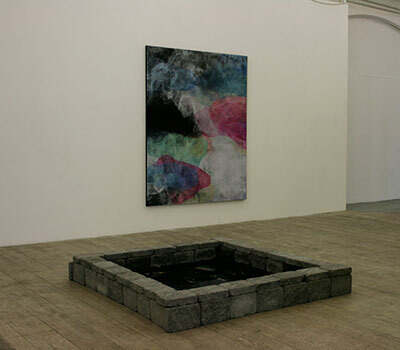 "The well"(on floor) is consisting photographys of wells, restplaces along the pilgrimage.Placed in water under the duration of the exhibition.